My objective is to work and facilitate with an organization or individual, in creating art in large or small scale commissioned for matte. As a creator of Art and Design, I believe that all works created or being created, takes on a life of its own. One always must work in harmony with the client and creator. When the project has been established and the work has been done, every one walks away having greater perspective of life. The joy of working together fulfills all. 1991 Beverly Hills Freedom Party, Props for Party reproductions Berlin Wall Check Point Charlie’s, and of Goddess of Democracies. 1991 George Michael, and Stevie Ray Vaughan both were Roof top displays. 1992 Sculpted- 6’ Baseball, Dam Yankees Movie for Motions Picture Academy-Displayed at Stinking Rose Restaurant of Beverly Hills. 1996 The Sea Shell House -Metal work “Blue Heron Remembrance” Sausalito CA. 1997 Residential Commission –Metal Work “ Deer Family” El Cerrito CA. 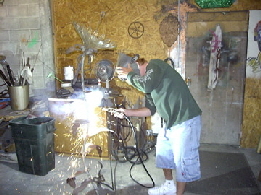 1997 Residential Commission – Metal Work “ School of Fish” El Cerrito CA. 1998 Residential Commission – Metal Work “ Under the Sea” San Bruno CA.